Angela Weston recalls growing up in Langley. 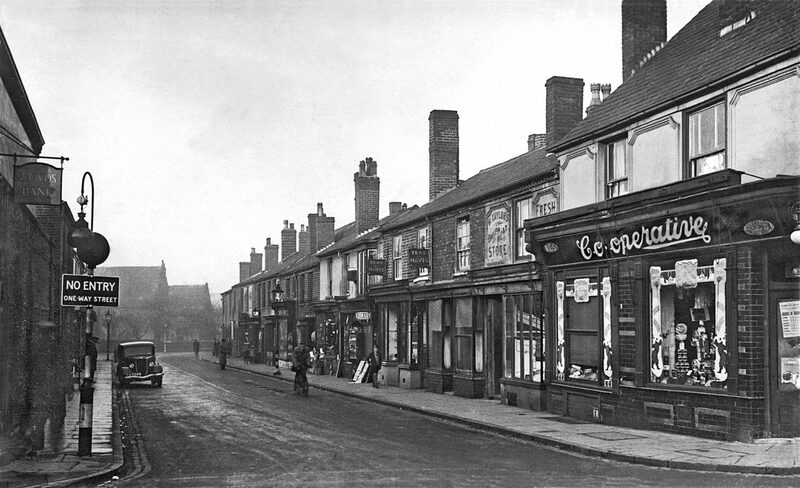 Trinity Street, Langley, circa 1938. This is a photograph of Trinity Street from the top, near the Co-op - my parents’ shop would have been right down as far as you can see at the bottom on the same side as the Co-op - unfortunately there never seem to be any photographs of the centre of the road, which was busy as the bus stop was right outside my parents shop. Trinity Street was the main hub of Langley – it’s where the buses passed and stopped. There was a stop outside my parents' shop. It’s where the carnival parades passed through. In fact, Trinity Street at one time was more of the hub than the High Street. The whole of the street was not only demolished but wiped off the map... there is no Upper Trinity Street anymore. I suspect that the only remaining bit is just a the point where Albright & Wilson begins. On leaving school at 15, I worked and trained at Albright and Wilson. I was first a trainee assistant to the Recreation Club Manager at Albright and Wilson and then I became Mr Burn’s secretary for a short while after Pam left, before I went to work in Birmingham. But there are a lot of tales I could tell you with regards to that position... some I couldn't repeat. Albright & Wilson News, 1960s. Some of my first boyfriends worked for local companies such as Tube Investments and the packaging company by the railway on the way to Oldbury. 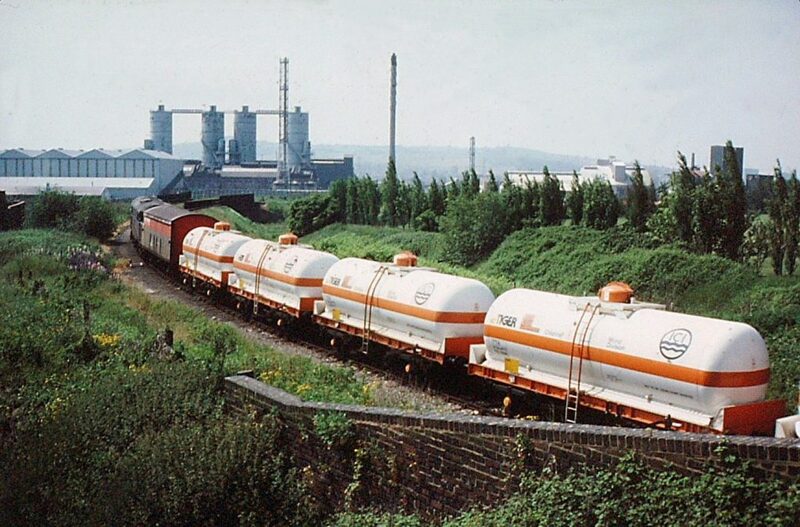 Later in my twenties in the 1970s, I worked for Ham Bakers in Clay Lane, which later became Biwater Valves. I return to my roots from time to time - on my last expedition I drove through what would have been our back garden which backed onto Albright and Wilson’s wall - that was an experience! My parents I believe were very fortunate. My father’s family lived in Dublin, so not close at hand. My mother’s family were very local, although she was estranged from them. I never met my mother’s family, who lived Sycamore Road off Clay Lane. In fact, when I worked at Ham Baker on Clay Lane and never realised that I walked past my grandfather’s house in Sycamore Road. I have tried on several occasions to obtain photos of the street but you only see the little from the top end and not very clear. 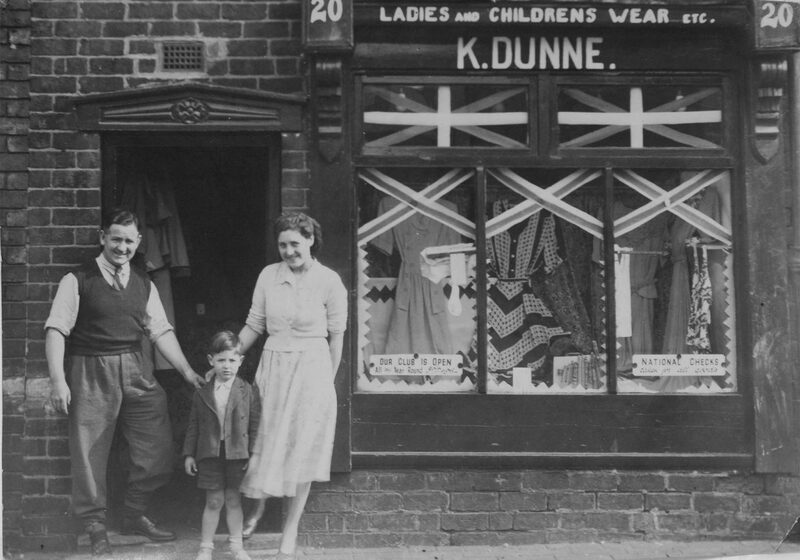 I do have in my possession, however, a photograph of the front of my parents’ first shop in Trinity Street - before I was born. They later moved to 34 Trinity Street of which unfortunately I do not have a photo. 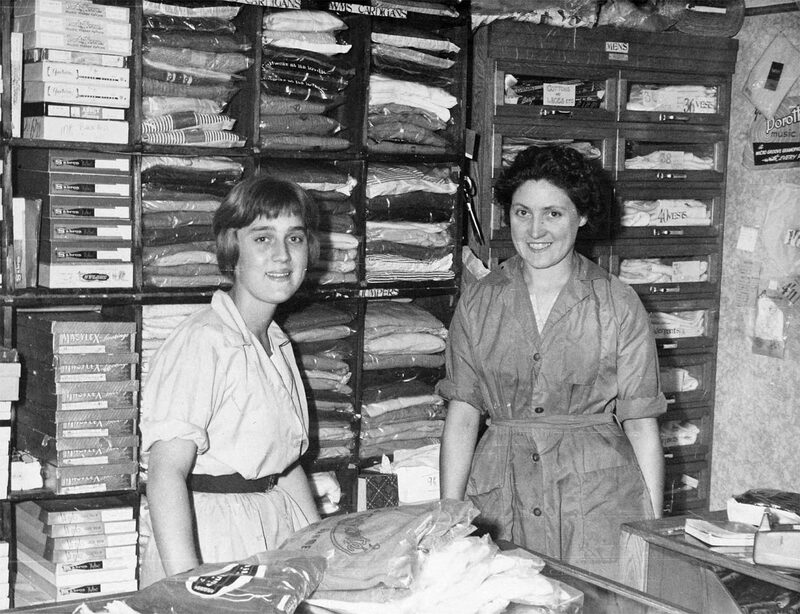 The second photograph (below) is taken inside 34 Trinity Street and shows my mother with one of their shop assistants - with whom I have recently had contact through Facebook. 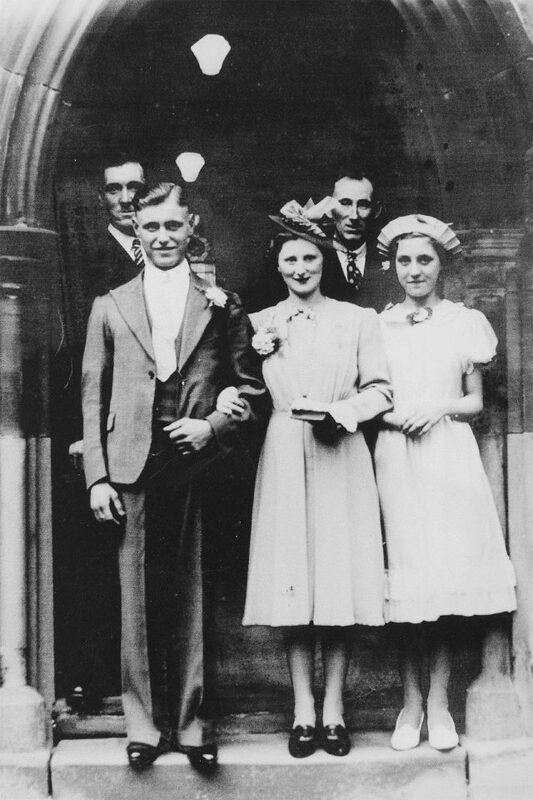 The third photo is of an uncles wedding - my mother is the bridesmaid and I think this was taken outside St Michael's Church; the fourth an advert for my parents' shop. They were fortunate because after the fall out with mother’s family (I believe) they went to live in the back to backs with an elderly lady by the name of Mrs Downing near the primary school in Langley. This elderly lady had an admirer and he was a businessman who owned many properties around the area. He was so happy that my parents were looking after Mrs Downing that he let them have their first shop rent free (which he owned, my parents didn't own number 20 Trinity Street - or so I am led to believe). By 1954 when I was born they had been so successful they were able to move to larger premises at number 34 Trinity Street. This was a very large detached property just past the bend of the road - that's why it can’t be seen on most photos. Our living/dining room, kitchen come bathroom was at the back of the shop - and I do believe it originally had an outside toilet. Our bedrooms were accessed in the shop - it being very large (size of two large rooms) there were two doors half way down the shop accessing spiral stairs - one led to the cellar, the other to the bedrooms of which I think there were three. There was a back yard that led off a corridor by the living/dining room and a gate in the yard led to a very large back garden, which backed onto Albright and Wilson’s wall. My parents worked very long hours - Monday through to Saturday - although I think they had half a day on Wednesday when they went to the warehouses in Birmingham. Sometimes I was allowed to steal a day off school to go with them and we would have dinner at the Woolworths in the Bull Ring Market area (I'm talking about the very old market area). 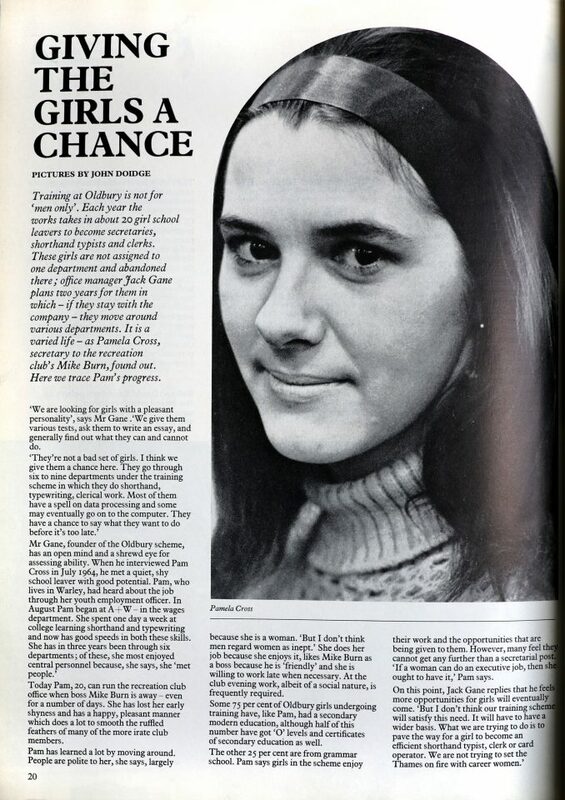 They had two shop assistants in later years - one was called Margaret Emery - I remember well and the other I think was a young assistant called Vicky. I should say three assistants because I often earned my pocket money by helping with things like writing out and pinning on the price tickets when I was a little older. The shop sold everything from bed linen and toys, to clothes including school uniforms - they were the major competition to Oakes in the area. I remember my father would often go out on a Friday night to collect monies owed for items that people had had on 'tick' or 'the never never' - sometimes I was allowed to go with him. He would also often visit the various schools with regards to the uniform - as far as Saltley in Birmingham and Bishop Milner, Sedgley. The shop was positioned excellently because all the workers from Albright and Wilson would often walk past the shop and look in the shop window - in the early days there was often an excellent children's manikin in the shop window - myself! Apparently I was fond of sitting in the window. The shop was also well positioned because it was near the bus stop and took a lot of passing trade from people getting off the buses. It was even more excellently positioned because the Carnival floats came through the street and I remember many a time the throngs of people who were standing outside the shop watching the displays. But my parents also owned caravans at Barmouth in Wales and Brean near Weston-Super-Mare, which they rented out to holiday makers. 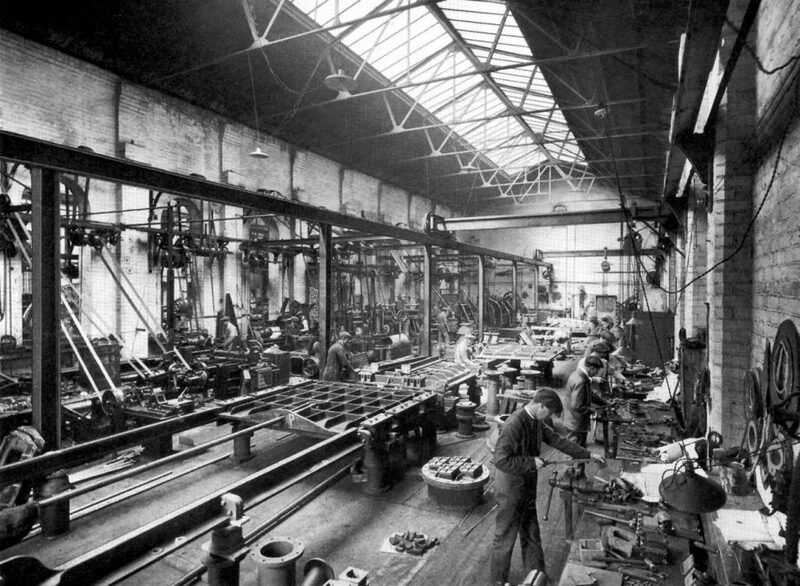 When they had finished and locked the shop on a Saturday, they would often make their way to either area if there was caravan available for them to use overnight, in order to ensure everything was fine. And then, on Sunday night they would make their way back home in order to be ready to open the shop on Monday morning! Once again they must have been very successful - because by the time I was five years old they had moved to a large semi-detached house in Brandhall Road at the top of Pound Road, near the Plough. 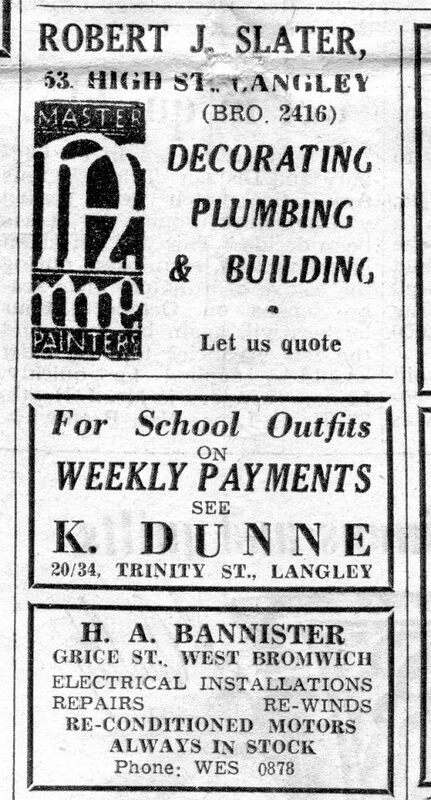 This was a new build house - they still had the shop in Trinity Street and would go there each day.